With the current set of digital tools, there is immense potential for small businesses with a loyal customer base. WordPress and WooCommerce enable you to create wonderful stores with minimal financial investments. If you are not already using WooCommerce, here is an article that will help you get started. So, once you get inside the world of eCommerce, you need to build a certain identity for your brand. When you are starting out, hefty advertising budgets and relentless marketing campaigns are out of reach. In this article, we will discuss some strategies you can adopt on your WooCommerce store for brand building. Some of these strategies, backed by industry experts, could bring about a positive transformation for your WooCommerce store. One of the first strategies that you can employ in building a brand is to tell your story to your customers and prospective buyers. It should help to create an emotional connect with your audience. Your ‘About us’ page is the best place to execute this strategy. You can also have a mission statement that should convey a positive outlook that resonates to your audience. Your customers would really appreciate an honest portrayal of why you are doing this business. It is possible that you may not have a dramatic story-line to describe your business intent. However, there will be always an interesting story worth sharing if you look deeper into the ‘why you are here’ question. And, that is the point that would create the emotional connect between your business and your customers. You can inform them about how your business evolved to become what it is now. How you envision it to move forward too will convey a certain trustworthiness with the brand. Along with these information, you can also include several aspects that you care for, including your social and environmental concerns, charity efforts, etc. How to write a good ‘About us’ page for your eCommerce store? A well-written ‘About us’ page can surely help to distinguish your brand from competitors. Here is a set of tips to help you write a good one. You can use a photo or video along with an interesting text. As you know, a visual can communicate much more than text. So, you can make use of this fact effectively on the page you tell your story to your customers. The flavor of the content that you add on the post can be according to the way you like to portray your brand. However, something that throws light into the internal aspects of your business might interest customers. 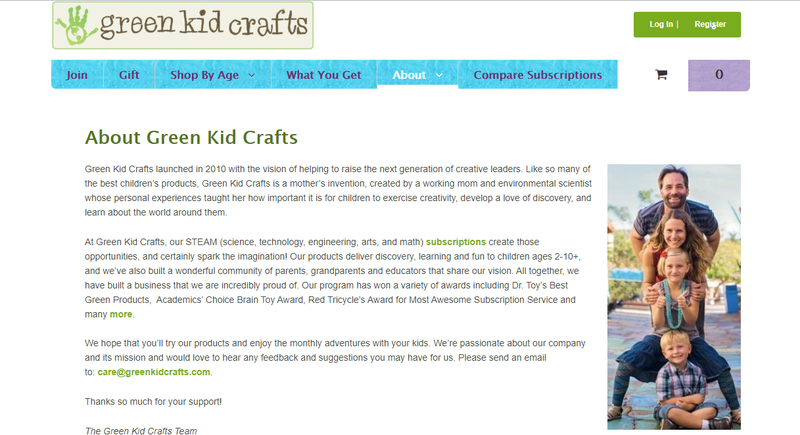 For example, Green Kid Crafts uses WooCommerce Subscriptions plugin to send activity kits for children. There ‘About’ page has the potential to easily connect with the target audience. Green Kid Carts has an ‘About’ page that easily connects to the audience it is targeting. Irrespective of the content that you add on the ‘about us’ page, this page needs to be engaging. You can take different approaches based on your business and products. However, make sure the language and tone is consistent to other copy on your site. For example, if yours is a toy store, something playful and funny would be naturally engaging. You can include some of your popular keywords in the ‘About us’ page as well. Though this is in no way the primary motive, it is not a bad thing to do if done organically. You can even link to some of your featured products in a strategic manner. Continuing with the same example of the toy store, you can talk about the design inspiration behind your top selling toy. Now, identifying your target audience is an essential aspect for any eCommerce store. Here is an article that will help you identify your target audience for your WooCommerce store. You definitely cannot attempt to please all your visitors. So, having a clear target audience would definitely help you place multiple aspects of your brand strategy effectively. Right from your mission statement to product images, you can use a style that resonates with your target audience. The copy across the site can thus capture the attention of the specific audience it is targeting. This will be a much easier and rewarding prospect for niche brands, when you are selling unique stuff. The website of Heist is a good example of keeping a tone consistent to the audience it is targeting. The images used on the site has the potential to grab the attention of the audience effortlessly. It is important to make your audience identify with your brand readily. Nothing helps in this aspect more than great visuals. In fact, the choice of colors you use on the website matters too. If you are using a particular color tone, you need to make it consistent across all channels you are interacting with your customers. For example, the emails you send to your customers too need to follow the color scheme that you choose. How will you manage this? Checkout WooCommerce Email Customizer to design emails that align well with the design patterns of your brand. Similarly, you can use images across the site that conveys your brand identity. Heist, the site we pointed out in the above section does well in creating a unique visual identity as well. This might even help users outside their target audience to take notice of the site and the products. Even though it is a concept that can be easily understood, it takes real effort to execute this. You might need good design inputs right from the start to create a good visual language for your site. Another aspect that you need to focus on is the way you create your product descriptions. In another article, we have discussed how to communicate value proposition while designing your site for your audience. You can merge a lot of ideas covering individual products as well as overall site design. For each product, you can figure out a unique feature that makes it stand out from the rest of the competition. If you are able to distinguish each of your products like this, the prospects of your site can really improve. Sometimes a product enquiry option can really help customers understand the product better. If your customers have queries regarding a particular product, they should be able to contact you easily. You can try Product Enquiry Form plugin for this. It adds an extra tab on your product details page, which customers can use to post their queries specific to the product. A personalized customer experience will have a huge impact on your customers’ perception of your brand. When you allow your customers to find a unique experience on your store, you are creating a strong case for them to remember. According to studies, eCommerce customers tend to come back to a site, where they had a great first experience. There are several ways to personalize customer experience on your store. You can allow customers to try out different combinations to help them build a product. This one helps your customers add extra features to the products they are purchasing. It can be as simple as gift wrapping a product. Or, you can give options like custom engraving, choice of materials to be used, etc. You can use a range of input fields such as text area, radio buttons, checkboxes, etc. With the help of this plugin, you can create product kits composed of different components that can be configured together to form a single product. For example, the way you can customize a laptop by choosing specific components like processor, memory, hard disk drive, etc. It even handles the complicated shipping settings of assembled as well as partially assembled products. You can customize the way it the product and components are displayed to customers. Displaying variations using images and color would make your product pages quite interesting. Your customers would appreciate the more interactive options than the more simpler input fields like drop-downs. When your product pages have such clean and organized layout, overall it help to create a better brand perception. With its default settings, WooCommerce doesn’t provide a gallery option for each of the product variations. This plugin will help you include a lot of gallery images specific to a particular variation. In fact, this will help your customers to see all the available options before confirming the purchase. Such things can really improve the customer experience on your store, and will add value to your brand building efforts. Having a clear return policy will do a world of good to your brand’s image. Your customers would definitely appreciate an option to return the products they don’t like. You need to clearly display your return and refunds policy on your site, so that customers are aware of it. This can be a positive influence on conversions too. However, handling returns and refund might become an added challenge to the already complex scenario of a store owner. You can make use of the below extension to manage your returns and similar returns to avail warranty from customers. This extension will help you offer your customers a chance to manage their return and warranty requests from their account page. At the same time, you can manage all such requests from the admin side. It also offers automated email communication for all return requests on your store. Another important aspect you need to pay attention to is how you are managing multiple channels of engagement. You might be dealing with your customers on several social media channels. Having a consistent pattern in your interactions and design elements is a very important aspect. Having a conspicuous logo everywhere, or using the same flavor in copy writing will help with better recollection of the brand in customers’ minds. Showing gratitude to your loyal customers by giving offers and discounts would help a lot in brand building too. And, there are several tools that will help you manage these with ease. Based on the lifetime value of a customer, or overall purchase history, you can offer a special rate. Here is a plugin that would help you set this up. This plugin will help you set up discounts to specific customers based on the number of orders and value of past orders. You can also select specific email accounts and offer price adjustments for them. And, there is an option to apply discounts based on user roles as well. Such an effort of personalized pricing can surely win a name for your brand. Building a brand from scratch is no easy feat to achieve. With eCommerce technologies being so accessible and popular, anyone can build a brand with some concerted efforts. We hope this article has provided some specific strategies and tools that will help you build a brand with your WooCommerce store. 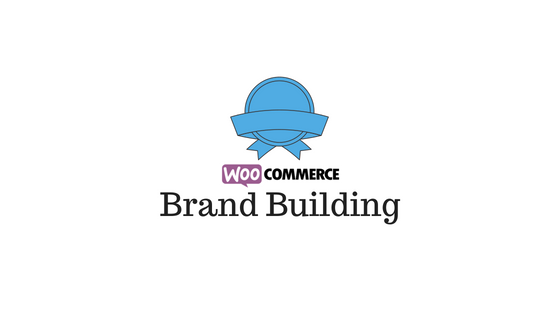 Share with us some of the strategies you have tried on your WooCommerce store for brand building. Previous articleHow to Clear WordPress Cache Effectively?